Flanked by female supporters, President Obama assures people without health insurance that they'll be able to get it this fall. As procrastinating Americans raced to confirm brunch plans and flower deliveries for Mother’s Day, the president of the United States took a policy-oriented approach to the holiday, pitching the benefits of his health care reforms to moms nationwide. President Barack Obama speaks on the Affordable Care Act on May 10, 2013 in the East Room of the White House. 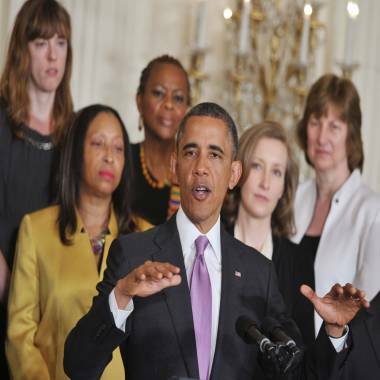 During an event at the White House, President Barack Obama decried “misinformation” about the law and urged parents not to be “bamboozled” by those critical of the law’s lingering criticisms about the 2009 legislation. Flanked by female supporters, the president praised the legislation’s provisions, including new rules that eliminate price hikes relating to women’s health and allow young people to stay on their parents’ insurance plans for longer. Obama conceded that “undoubtedly there will be some mistakes and hiccups as this thing gets started up” but that the program’s implementers are quickly responding to problems. “The same folks who fought tooth and nail a couple years ago and tried to make political hay out of ‘Obamacare’ are still telling tall tales about its impact,” he said. At the outset of his remarks, the president offered a tongue-in-cheek reminder to those who may have forgotten the upcoming Mother’s Day holiday. He joked that, early in his marriage to wife Michelle, he wondered aloud why such a fuss is made over moms for one day in May. “Because every other day is Dad’s day,” she responded.